COOLIDGE, John Calvin (1872-1933) was an American politician and the 30th President of the United States (1923–1929). A Republican lawyer from New England, born in Vermont, Coolidge worked his way up the ladder of Massachusetts state politics, eventually becoming governor of that state. His response to the Boston Police Strike of 1919 thrust him into the national spotlight and gave him a reputation as a man of decisive action. Soon after, he was elected as the 29th Vice President in 1920, and succeeded to the presidency upon the sudden death of Warren G. Harding in 1923. Elected in his own right in 1924, he gained a reputation as a small government conservative and also as a man who said very little, although having a rather dry sense of humor. 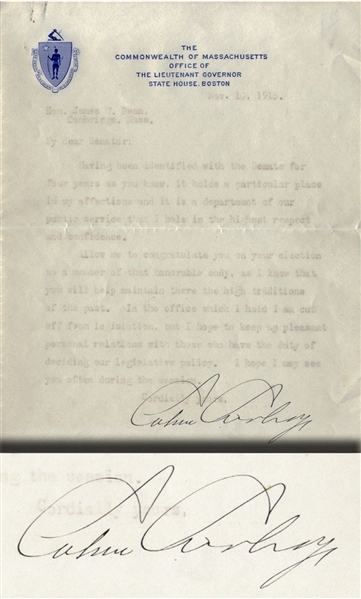 Typed Letter Signed “Calvin Coolidge” as Lieutenant Governor, NOvember 15, 1916, and reads in part: “...Having been identified with the Senate for four years s you have, it holds a particular place in my affections and it is a department of our public service that I hold in the highest respect and confidence...” More. Very light. Signature bold and dark.